"An animated epic featuring three all-new backgrounds and five characters!" Cartoon Network's Aqua Teen Hunger Force stars talking fast food, but there's a good reason its translation into a theatrical feature didn't garner any endorsement deals�the show is freakin' weird. 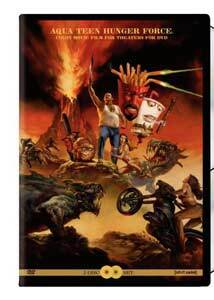 A favorite on college campuses maybe, but the adventures of Master Shake (a talking milkshake), Frylock (a flying order of fries), and Meatwad (morphing raw meat) are anything but mainstream, which is why it's a little amazing anyone put up the budget for what is known as Aqua Teen Hunger Force Colon Movie Film for Theaters. The TV series prides itself on the kind of humor that's often only recognizable as humor because we know it's supposed to be funny, even if we, personally, aren't laughing. Not exactly a formula for box office success, even if it does kick off with a bit about Abe Lincoln traveling through time causing mayhem in a VW Beetle. There's sort of a plot, but it really, really doesn't matter. Something to do with an exercise machine with the power to change the future for all mankind, possibly placed on earth by aliens (including everyone's favorite slow-moving videogame sprites the Mooninites) or a robot from the future who likes to hump things or the mad scientist Dr. Weird or maybe this talking watermelon named Walter Melon. But somehow it winds up being purchased at a garage sale by the ATHF's neighbor Carl. And the point of the thing is does the origin of the exercise machine tie in to the origin of the ATHF? They can't quite remember where they came from, and multiple flashbacks offer progressively weirder answers, until a final reveal that makes so little sense, there's a cut to black and the movie ends right there. The story is so not the point. So, this is either brilliant stuff, dada-ism or surrealism, or... it's a bunch of stupid crap thrown together and called a movie. I don't quite know where I fall. The truly bizarre flights of fancy, the blatant disregard for anything approaching conventional humor, the outright infuriating pacing�it's all such a gamble that it's almost a kind of post-modern masterpiece. But... it's also frequently just stupid, or obscene, or very violent just for the sake of showing a little blood (Meatwad takes a shotgun blast to the face, Master Shake manages to cut off both of his hands with a booby-trapped teddy bear, and at one point, Dr. Weird turns inside-out for no reason). Suffice it to say, it's an acquired taste. If you like the show, I can't imagine not enjoying the movie. I also can't imagine anyone liking the movie who doesn't at least have some affection for the series. After all, what sometimes seems long at 11 minutes is going to seem very long at 86 minutes. It basically is the show, after all�don't expect fancy big-screen animation, because it still pretty much looks like junk, one step above cheap internet flash cartoons. Admittedly, that's some of the charm, but it's really hard to think of this as a theatrical film when you're watching it at home on DVD. It just sort of seems... longer. So if you like Aqua Teen, but just want more of it, here's 80-odd minutes more. That's about it. I laughed a bunch, so I'm giving it a good grade. Image Transfer Review: For what it is, the movie looks great�bright colors, clean lines, no blemishes. But what it is, is crappy animation, so don't expect anything more than what you get on DVDs of the regular series and you'll be pleased. Audio Transfer Review: The 5.1 mix sounds pretty good. There's a lot of action up front, and dialogue is clear, but directionality is somewhat limited. The surrounds are active, but again, the separation doesn't really stand out (there aren't any panning effects or anything like that). Extras Review: There are plenty of extras on this two-disc set, but your enthusiasm for them will likely mirror your relationship with the show, as a little seems to go a long way. Disc 1 starts normally enough with a commentary, except the only person on it that really had anything to do with the movie is Dana Snyder, the voice of Master Shake. The other three�Patti Smith, SNL's Fred Armisen, and The Onion editor Todd Hanson, are just there for fun. So if you want to hear a commentary track that really has very little to do with the movie, this is the one for you. There's also a crude animated gallery of "production art" (that's overselling it), two trailers, and a "sizzle reel" that is basically a third trailer, but a little longer. The menus feature crude, early 1990s 3-D animation, and you can watch a three-minute reel of all of the footage together (it looks pretty bad, but still technically probably a bit better than the movie proper). The only really substantial bonus is the 26-minute fly-on-the-wall making of piece The Thing We Shot Wednesday Night, which follows, in fairly entertaining fashion, the progress of the film from its inception in 2004. It provides an interesting look at the behind-the-scenes effort that goes into creating all the engineered chaos of Aqua Teen. There's a whole second disc to go through, but this is where the fans and fanatics will part ways�a lot of Disc 2 is a little tough to take, not the least of which is an 80-minute "deleted movie" that presents the creators' original storyline is somewhat complete fashion. All the voice tracks are complete but the animation is very rough, making it difficult to watch for more than a few minutes. I saw enough to get the gist�the plot appears quite a bit different, though it includes many of the same scenes and gags. There are also a bunch more deleted scenes (eight in all), including one that's 22 minutes long (incorporating a bit of the "deleted movie" along the way). The rest of the cut footage is mostly brief scene extensions with an extra gag or, because this is Aqua Teen, much, much longer versions of gags that aren't really that funny in the first place. You know how it goes. Ten gag endings run about 30 seconds each and have no relation to the movie whatsoever. But they're kind of funny, usually spoofing genre conventions like the "gotcha" endings of horror films. There are four music videos, but I'm not really sure what they have to do with the movie, except Master Shake sings one of them, and a few "behind the scenes" clips of the musicians at work. There are some weird promotional pieces, including four "man on the street" interviews featuring Dana Snyder interviewing clueless patrons who have obviously never heard of the movie they are being asked about, and some Cartoon Network bumpers that never actually name the movie. My favorite is an interview between Snyder and "Danny Mothers" (played by comedian Bob Odenkirk), the nervous host of a show called I Love Movies whose questions have nothing to do with Aqua Teen and everything to do with Morgan Freeman and Steven Spielberg. I do like the packaging, from the heavy metal cover art to the clever illustrations on the discs themselves (one of them looks just like a bootleg DVD), but the presentation has some quirks�there's no scene selection menu for the feature, for one thing, though there are thankfully plenty of chapter stops. Aqua Teen the movie is as hit-or-miss as Aqua Teen the series, but somehow it wasn't nearly as exhausting as I'd expected over the course of its 80-odd minutes. I think they won me over with the opening gag about a renegade Abe Lincoln traveling through time for some reason. I think he's the one president I'd fully trust with the fate of the time/space continuum.